Billy Southworth, his first manager in Boston, called him “as fierce a competitor as I’ve seen in all my years in baseball.”2 Second baseman Roy Hartsfield said, “Torgy is a very humorous fellow – until the ball game starts.”3 In 1948 Torgeson took offense in a preseason “City Series” game at Braves Field when Red Sox infielder Billy Hitchcock got tangled up with him while returning to the first base bag. After it happened again, Torgeson belted Hitchcock in the mouth, causing both benches to empty and a free-for-all to erupt. The skirmish cost Torgeson his glasses, and after this he would always remove them before a pending confrontation. Then there was the time in 1950 he was hit in the ribs with a pitch thrown by the Pirates’ Cliff Chambers. The very next day Chambers threw one at Torgy’s head; believing this action had crossed the line, Earl angrily conversed with the pitcher. The conversation did not go well. After removing his glasses, Torgeson charged the mound and started a multi-player melee. Torgeson played the rest of the season with a broken rib, the result of Chambers’ first errant fastball. Fortunately, the second one had missed his head. A few years later, as he batted in the bottom of the first on July 1, 1952, at Braves Field, Torgeson’s backswing hit Giants’ catcher Sal Yvars on the shinguard. After Torgeson lined a single up the middle, Yvars picked up the bat and slammed the handle on the plate, shattering it. Torgeson was stranded on the bases, so he did not return to the Braves dugout until after the Giants were retired in the top of the second. When he discovered the broken bat, Torgeson removed his glasses, then sprinted across the field to the Giants’ dugout and slugged Yvars in the face, leaving the catcher’s right eye swollen, discolored, and bloody. “Sal and I always have been good friends. But breaking a guy’s bat is like slapping him in the face.” Torgeson said after this incident, “We may be in seventh place but we don’t have to take that insult.”4 Torgy was fined $100 for the fight, Yvars $25. The good friends brawled again on July 18‚ 1954, after both players had changed teams. “If I had to do it all over again I wouldn’t have been such a character,” Torgeson reflected many years later. “I just regret the fact that I’m labeled a bad boy.”5 The second “Earl of Snohomish,” following townsman Earl Averill, wasn’t really a bad boy – he was well-liked, even by the people he was socking in the mouth. He loved laughing, joking with his teammates, and going out on the town. He played baseball with a passion, and the brawling, the all-out head-first slides, this was part of how he needed to play the game. He paid the price for this passion with seemingly annual game-related injuries. Clifford Earl Torgeson was born in the lumber mill town of Snohomish, Washington, on New Years Day of 1924, the second son of Melvin Carl Torgeson and the former Helen Kornelia Gray. Melvin was a carpenter of Norwegian heritage, while Helen was English and Native American. The couple divorced when Earl was very young, but they both remained in Snohomish and stayed involved in Earl’s life. Helen was a fun-loving woman who married Harold King, with whom she ran an appliance store in town for many years. Melvin Torgeson remarried as well, to Clara Morris, and built many of the beautiful homes in the Snohomish area. Earl lived off and on with each parent in the small town. Like many Snohomish boys, Torgeson idolized Earl Averill, the first “Earl of Snohomish,” the slugger and centerfielder for the Cleveland Indians during most of Torgeson’s youth. Averill would return home every fall and drive around town in his fancy car, causing the boys to stare, vowing that they would follow him to the major leagues one day. Torgeson used to follow his idol around town, staring in the barber’s window watching him get his haircut. Torgeson first played baseball on the aptly-named Averill Field near his home, and he played it as often as he could. Despite needing glasses as a youngster, he also starred in basketball on a team of much older boys. But his prowess on the diamond, along with the public success of Averill, led townsfolk to petition to school board to prohibit Torgeson from playing football for fear of injury. After playing just two varsity games, he was removed from the gridiron team. After two years of high school baseball, a year of American Legion, and several years playing semiprofessionally in the area, Torgy signed in 1941 with the Seattle Rainiers on the advice of an old scout named George Hokum. Earl trained with Seattle in ’41, but the 17-year-old was soon optioned to Wenatchee of the Class-B Western International League. His manager there, Ted Merritt, took one look at the tall, gangly, bespectacled Torgeson and asked, “What in the Lord’s name have they sent me now?”7 His new first sacker hit .332 in 92 games. In a 1941 late-season recall to the Rainiers, he got to play with the 39-year-old Averill (just retired from the big leagues), and was an impressive 4-for-10 in four games to help the Rainiers win a tough pennant race and capture the Pacific Coast League title. The next year Torgy was farmed out to Spokane (also of the WIL), but a week into the season the Rainiers sold incumbent first baseman Les Scarsella to Oakland and promoted Earl, who had hit .429 in 28 at-bats for Spokane. Now playing in the best league west of St. Louis, he hit .312 with 32 stolen bases in 147 games for Seattle. Now about those stolen bases. Torgeson was a big man, listed at 6 feet 3 and 180 pounds at the start of his career, and was always expected to hit for more power than he did. Even well into his major league career, Torgeson hit in the power slots of the batting order, as befitting a large first baseman. He never did develop a lot of power, but he had a great batting eye and was very fast on the bases. Had he had a different body but the same skills, he would have been a fine leadoff man. The 18-year-old Torgy likely would have been sold to a major league team after the 1942 season had he not been about to be drafted. He served in the Army from January 1943 until March 1946. After a year at Fort Lewis and Fort Lawton in Washington State, Earl saw action in the Aleutians, then in France and Germany. He was injured in the Battle of the Bulge by the blast of a shell that landed in his platoon. When Earl reported back to the Rainiers in 1946 the season had already begun. Two days before the Braves’ option was to expire on August 20, Torgeson dislocated his right (nonthrowing) shoulder. The Rainiers granted an extension, and after the Braves looked him over they made the deal. After 3½ years away from the game, Torgy slumped to .285 in 103 games for Seattle. In one way Torgeson and Williams could not have been more different. While Ted was known for refusing to tip his cap to the fans, after a home run Torgeson would take his hat off and wave it around in the air. His personality personified the differences between the images of the two teams – the Braves being the blue-collar team of the fans, the Red Sox the rich, pampered club of stars. Torgeson became a crowd favorite. Although he cooled off later in ’47 and lost some playing time to Frank McCormick, Torgy ended up hitting .285 with 16 home runs as a rookie – compared with 10 round-trippers total in three minor-league seasons – and 82 walks. Billy Southworth wanted to take it slow with his young player, and generally left him on the bench against left-handed starters. Even at a young age, Torgeson quickly became a leader on the club, a guy not afraid to hold court in the clubhouse. Platooning with Frank McCormick in 1948, he slumped to .253 with 10 home runs, but added his typical 81 walks (fourth in the league) and 19 stolen bases (fifth) for the pennant-winning Braves. In the World Series he started five of the six games, missing only lefty Gene Bearden’s shutout in Game Three. Torgeson, hitting third in the lineup, hit safely seven times in 18 trips, including three doubles. His .389 average led all regulars from both teams in the Series. Earlier in ’48, Torgeson had contributed to another significant event. On May 22, manager Billy Southworth and several members of the team, including Torgeson, visited a local hospital to surprise a young leukemia-stricken boy from New Sweden, Maine, an event which was later broadcast on Ralph Edwards’ Truth or Consequences national radio show. Named “Jimmy” to protect his privacy, the 12-year-old was presented with a regulation team uniform and a bat from his fellow Swede Earl Torgeson. Money flowed in for Jimmy’s treatment, which spawned the “Jimmy Fund” charity of today’s Dana-Farber Cancer Institute which was supported by the Braves until their 1953 departure from Boston and has been championed by the Red Sox ever since. For many years, it was assumed that Jimmy had passed away as only 15 percent of the children encountering his type of cancer then survived. But a half-century later, Einar Gustafson, the real Jimmy, emerged from obscurity and became an instant celebrity. He even still possessed his child-sized Braves uniform and Torgeson’s bat, and both were put on display at the Baseball Hall of Fame in 1998. The 1949 season was far less memorable for Earl. In early May, he made an aggressive attempt to take out Jackie Robinson at second base on a double-play ball, slid clumsily and separated his left shoulder. The injury sidelined him for three months. In August he began working out again, but suffered a broken thumb in a fight after curfew involving teammate Jim Russell and three soldiers – it’s not completely clear what happened, and Torgeson would never talk about it. His season was over after just 25 games, in which he hit .260 with four home runs. The following spring he spent several weeks getting his shoulder to learn to throw again – his former overhand motion replaced with a more accurate sidearm toss. His first-rate play around the bag was now that much better. Torgeson opened up a sporting goods store in Wellesley, a Boston suburb, with Hank Camelli, a 1947 teammate, and worked there in the offseasons. He also had become a popular after-dinner speaker and had his own radio show, and later a television show. 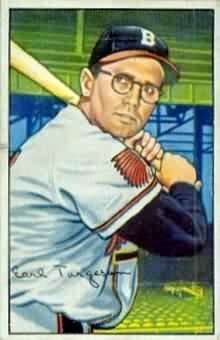 In 1950 Torgeson was a full-time player for the first time, playing all 156 Braves’ games, coming through with 23 home runs, 87 RBIs, and a .290 batting average. He also walked 119 times, third in the league, and led the senior circuit by scoring 120 runs. Historian Bill James suggests that Torgeson might have been the best player in the National League in 1950. The next season he again played every game (155 this time), finishing at .263 but with 24 home runs and 92 RBIs. He walked 112 times, and stole 20 bases. Despite his fine play, however, the Braves finished fourth both seasons. Torgeson had been married in 1946 to the former Norma Syverson, a beautiful woman of Norwegian descent from Twin Valley, Minnesota. Norma and three sisters had gone to Seattle during the war to find employment. There she met Earl, and they married when he returned from the service. The Torgesons had two children: Christine and Andrew, who later played two years in the New York Yankees’ organization. In the early years of Earl’s career the family would accompany him to spring training and then back to Boston for the season. In 1951 the Torgesons settled in Anna Maria, a sparsely populated coastal island in the Gulf of Mexico, not far from the Braves’ spring training site of Bradenton, Florida. Many baseball players and families owned cottages nearby, including Warren Spahn, and many baseball teammates and friends visited often. Torgeson’s great friend Fred Hutchinson was also a neighbor there. Torgeson spent many a winter golfing every day with his baseball friends. He also loved to host barbecues, gatherings of friends and teammates eating ribs, or lobsters shipped from Maine and prepared by Earl himself. Despite his fairly impressive statistics, in 1952 many fans and writers thought Torgeson would lose the position to George Crowe, a rookie (and one of the first black ballplayers on the Braves) who had hit .339 or better his previous three seasons in the minor leagues. Torgeson ended up getting most of the playing time, but had his worst year in the majors – hitting .230 with just five home runs in 122 games. After the season Earl was dealt to the Philadelphia Phillies in a complex four-team swap also involving the Dodgers and Reds. For the Braves, this sequence netted them Joe Adcock, who held down first base for the next 10 years. In 1953, his first year in Philadelphia, Torgy took most of the playing time from incumbent and close friend Eddie Waitkus and hit .274 with 11 home runs in 111 games. Once again, however, an injury set Earl back. He dislocated his right shoulder in January of ’54 when he tripped over his dog one night on his way to bed, and he supposedly kept the incident a secret from everyone other than the trainer and a few teammates. The injury sapped his power, leading to just five home runs and a .271 batting average in 135 gutty games. Near the end of the season he broke his thumb, and he ended up having surgeries to correct both conditions. The following June, his power still not recovered (just one home run in 47 games), Torgy was sold to the Tigers at the June 15 trading deadline; a few weeks later, the Tigers released Ferris Fain, who had been playing first base. Torgeson played very well in Detroit, hitting .283 in 300 at bats, with nine home runs and nine stolen bases without being caught. He also continued to walk, drawing 93 in his two stops during 1955. In January 1956, the convertible Torgeson was driving flipped over on a curve, pinning him beneath the steering wheel. Torgy suffered cuts and bruises but remarkably broke no bones. He was charged with reckless driving while drinking, and with not having a driver’s license. All of this netted him a $50 fine. In the season ahead, he hit .264 with 12 home runs in 117 games. Over the next two years, however, Torgeson became more of a part-time player for the White Sox. In June of 1958 Chicago made a deal with Detroit for Ray Boone, who got most of the playing time at first base the rest of that season. Torgeson played 73 games there, including 45 starts, but pinch-hit and pinch-ran enough to get into 96 games, hitting .266 with 10 home runs. In 1959 Boone had moved on, but the White Sox first gave the job to rookie Norm Cash, who failed to hit, then turned to Torgeson for a few months, and finally acquired Ted Kluszewski in late August to take over the rest of the way. Torgeson hit just .220 with nine home runs. In the World Series he managed a groundout and walk in his two plate appearances, as the White Sox were defeated by the Dodgers in six games. Torgeson was 36 years old entering the 1960 season, and his days as a regular player were over. Nonetheless, he stuck with the White Sox and stayed all year as a pinch-hitter, hitting .263 in 57 at-bats. After going just 1 for 15 through June 15 in 1961, he was sold to the Yankees, for whom he was no better (2 for 18). On September 2, he was released and redeployed as a coach. He was not on the World Series roster as the Yankees defeated the Reds four games to one. Earl and Norma divorced in 1961 as Earl’s baseball career was ending. In 1963 Torgeson married Molly Power from White Bear Lake, Minnesota, and had three more children: Holly, Brad and Tina. Earl is remembered as a supportive father, who attended many of his children’s sporting events through the years, sitting quietly in the stands, supporting their wins and losses. When Torgeson retired from baseball, he briefly worked as a stockbroker with Mitchell Hutchins Brokerage in Chicago. Soon after he owned and operated Camp Forsyte, a sports camp for boys in Westfield, Wisconsin, which sponsored many underprivileged kids from Chicago in addition to the paying campers. In 1965, Earl and Molly moved to Everett, Washington, near where Earl had grown up. Torgeson took a job as director of parks for Snohomish County. When major league baseball arrived briefly in Seattle in 1969, Torgeson was hired to manage the Newark Co-Pilots in the New York Penn League that summer, and then the Clinton Pilots in the Midwest League in 1970, succeeding Sibby Sisti. (Both ballclubs were Seattle affiliates). He even suited up for the big-league Pilots as a batting coach in the last few weeks of the ’69 season. Earl’s previous managerial experience had been in Managua, Nicaragua, during a couple of winters in the late 1950s, and this marked the end of his professional career. His Newark team finished 42-34, in third place, while his Clinton club came in at 57-67. Earl was elected a county commissioner in 1972 and served four years. While in office he fought off several schemes from political enemies. He was also charged and tried for allegedly using county labor and materials to work on his car and summer home, charges which cost him three years and $25,000 to successfully defend. Two later attempts at re-election were unsuccessful. He later worked many years with a timber company, and served as the county’s director of emergency management for eight years. 1 John Gillooly, “Earl of Snohomish II,” Sportfolio, September, 1947: 46. 2 Harry T. Paxton, “The Jesting First Baseman of Boston,” Saturday Evening Post, May 26, 1951: 27. 4 John Drohan, “Bat Breaking ‘Slap in Face’ And Torgy Couldn’t Take It,” Boston Traveler, July 2, 1952. 5 Edward Kiersch, Where Have You Gone, Vince DiMaggio (New York: Bantam, 1983), 104. 8 Royal Brougham, “Seattle Seconds Braves’ Raves for GI Torgy, First Base Star,” The Sporting News, January 17, 1946. 10 Hub Miller, unidentified clipping, dated August 1947, in his Hall of Fame file, 302. 12 Lou Miller, “Torgy Steals Home to Win—Turley’s Face Turns Red,” The Sporting News, July 27, 1955: 24. 13 Edgar Munzel, “Torgy Rates Added Salvo From Senor for Batting Extras,” The Sporting News, November 13, 1957. 14 Christine Torgeson, interview with author, September 12, 2006. 15 Obituary, Seattle Post-Intelligencer, November 10, 1990. 16 David Eskenazi and Steve Rudman, “Way Back Machine: The Earl of Snohomish 2.0,” SportsPressNW.com, July 17, 2012.